Elegant interior decorating ideas from Studio B Architects are grea for creating spacious and simple contemporary home, wedged between hills beneath Shadow Mountain. Large windows and light interior decorating colors celebrate expansive views and sunny location, providing peaceful retreat and beautiful spot for living. Light and dark wood color combination, simple dining room, bedroom and living room decor with charming exotic accents, fresh flowers and candles make a contemporary interior decorating feel unique and comfortable, warm and welcoming. The landscape beauty, gardens and decks play the main role in this house design. Few unique decorating accents, comfortable living room furniture, soft floor rugs and creative lighting ideas bring chic and style, celebrating the natural beauty. Quiet and calming interior decorating ideas, pleasant light and dark wood color combination, combined with large windows and a roof canopy that deflects the sound of the Castle Creek below into home interiors, create peaceful and pleasant atmosphere of luxurious retreat. Wood floor and ceiling, console tables and dining furniture, made of wood and soft upholstery fabric in light and dark brown colors bring even more comfort and coziness into modern room decor. Large wall art and interesting decorative accents give room decor character and add charm. Flowers and fruits add a splash of fresh natural colors, offering simple eco friendly interior decorating ideas for spacious, sleek and modern home interiors. 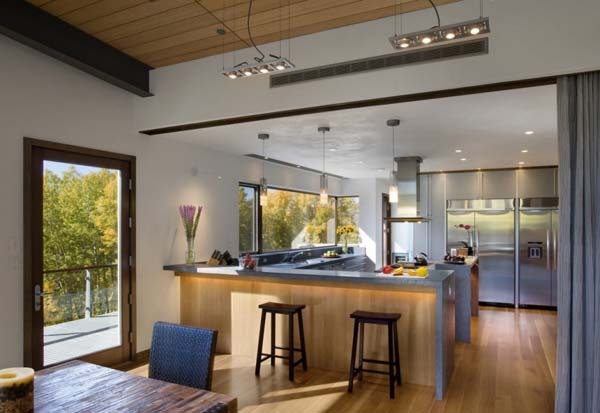 Natural stone, steel and glass bring balance into contemporary interior decorating. Attractive contrasts of light and dark wood color combination add dynamic to modern room decor, making a house look interesting and calming, relaxing and elegant.